Hurricane Irma Update, Forecast, Track, Satellite Image (September 10, 2017) | #HurricaneIrma - Balita Boss! 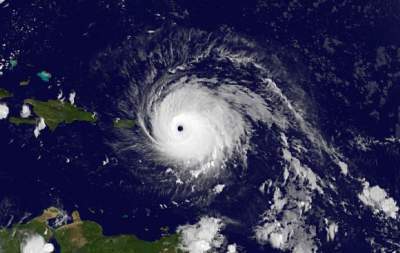 Filipinos in Florida and the Caribbean have been advised to take safety precautions as Hurricane Irma approaches. According to the United States National Hurricane Center, Irma is now a Category 5 hurricane, a potentially catastrophic storm that is making its way across the southern Atlantic Ocean. "Our kababayans in Florida and other parts of the East Coast and the Caribbean must heed the warnings of weather experts and take the necessary precautions to ensure their safety," Foreign Affairs Secretary Alan Peter Cayetano said in a statement Wednesday. Filipino nationals in areas to be impacted by Irma who may need assistance can call the emergency hotlines of the Philippine Embassy in Washington, DC at +1-202-368-2767 and the Philippine Embassy in Mexico at +52-155-2771-3776. Here's the update on Hurricane Irma from the National Hurricane Center. "IRMA CONTINUES TO SLOWLY WEAKEN WHILE MOVING OVER SOUTHWESTERN GEORGIA." According to the weather advisory of NOAA NWS National Hurricane Center, issued at 4:55 p.m. AST/EDT, Tropical Storm Irma is centered at 5 p.m. EDT about 150 miles south of Atlanta with maximum sustained winds have decreased to near 50 mph (85 km/h) with higher gusts. It is forecast to move north-northwest near 17 mph (28 km/h), and a turn toward the northwest is expected by Tuesday morning. On the forecast track, the center of Irma will continue to move over southwestern Georgia tonight and move into Alabama on Tuesday. Continued weakening is forecast, and Irma is likely to become a tropical depression on Tuesday. Tropical-storm-force winds extend outward up to 415 miles (665 km) from the center. The estimated minimum central pressure is 985 mb (29.09 inches). A Tropical Storm Warning is in effect from north of Altamaha Sound to the South Santee River. For details on impacts, go to www.nhc.noaa.gov/#Irma The next complete advisory will be issued by the National Hurricane Center at 11 pm AST/EDT - www.hurricanes.gov. "We advise all our kababayans along the path of Hurricane Irma to stay indoors and avoid unnecessary travel until the storm has passed,” said Chargé d’Affaires Chuasoto. Chuasoto said the Embassy is in touch with Honorary Consul Henry Howard in Florida and Honorary Consul Fitzgerald Brandt in Port-ay-Prince. Ambassador to Mexico Eduardo De Vega said Irma will also hit Cuba, with a Filipino population of more than 500, and the Dominican Republic with around 100. Ambassador De Vega said the Embassy in Mexico remains in touch with leaders of the Filipino Community in Havana and with Honorary Consul Limuel Dudalo in Sto. Domingo. For latest updates, kindly check below the Tweets about "#HurricaneIrma".